Holy moly, it's JULY! Where did that come from? I mean, my summer just started people. I better start livin' up this month because come August 1st, it's back to the classroom I go to prep for the new school year. Yikes! 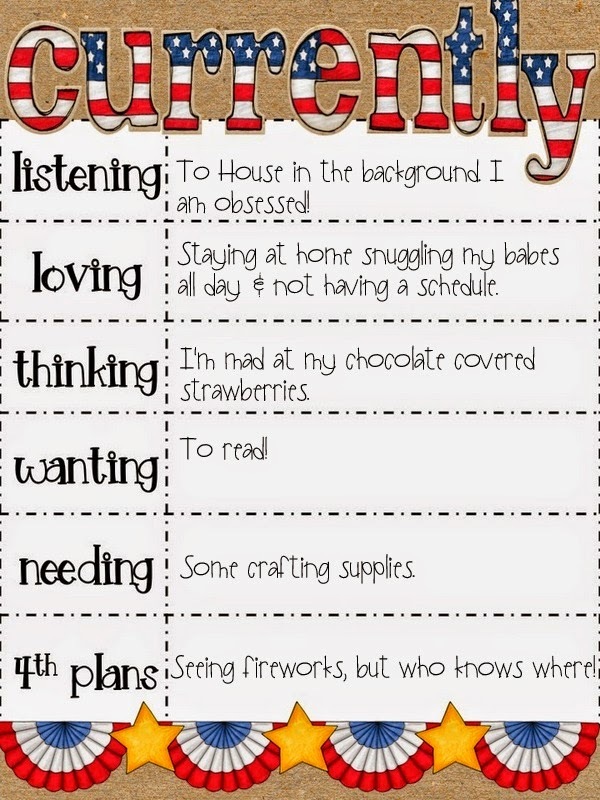 I'm linking up with Farley at Oh Boy 4th Grade for her monthly linky party. I love this linky! Listening: I am a complete Netflix junkie. I absolutely love TV. I know, how terrible. I could sit around and watch TV all day. It's quite sad. I started watching House and feel like I can't stop. I feel like I can be quite the hypochondriac so me watching this show is a pretty awful idea. I WebMD every symptom I have like every single day, so watching this show full of crazy medical problems... Yea. Loving: Enough said. I love being home with my puppies all day! Thinking: Yea, so I bought strawberries at the grocery store. I really wanted to make chocolate covered strawberries. So, literally just 30 minutes ago, I started to melt chocolate chips. Well, they didn't melt creamy; they melted as a big pile of mush. That was fail #1. Fail #2 was when I found chocolate baking squares in our cabinet. Got all of my strawberries nicely covered and then took a taste. Yea, it was UNSWEETENED chocolate. What's the point of that? Why do I even own that? So, they taste like nasty. Like, really gross. So, what a waste. And, I hate wasting food so I'm pretty irritated with myself. Plus, I have no chocolate covered strawberries still. Needing: I have some crafty ideas for my classroom up my sleeve. Pictures will come when I dive in. 4th Plans: Fireworks of course! We just aren't sure where we are watching yet! I love crafts! Can't wait to hear what you are doing! Found you through Farley's link up! Is Insurgent the third book? I read the other two if it is. TO be honest I liked the series by Ally Condie a little better (Matched, Crossed, Reached are the titles). Books recommended on my blog today, too! I'm so sorry about the chocolate covered strawberries! What a bummer. If I lived nearby, I'd be brinign you something chocolate for sure!!! I always add a little coconut oil to my chocolate when I'm melting it. I'm not sure where I got that idea, but I think it helps to keep it from burning, clumping, or whatever. Hope you have a happy 4th! Can't wait to see what crafts you have up your sleeve for you classroom. Everyone needs crafting supplies - I am a paper addict myself. Your blog is adorable - great logo! I just found you through Farley's currently. I just moved all of my sewing and crafting supplies upstairs to my new sewing room so I know I do not NEED anymore supplies. But that doesn't stop me from pinning more ideas and wanting to head to Hobby Lobby! Glad I found your blog through Farley's Currently!